I run a sports camp and ordered these for all the campers. They bring them to camp everyday and really do love them. Thanks for the business Custom Earth Promos. I used the customized water bottles to increase my exposure at all my trade-shows. It worked like a charm and I couldn't thank you guys enough. Love this company! They gave me a huge discount for my bulk order! Wouldn't order my promotional eco-friendly products from any where else! Really appreciate the exceptional service CEP! I run camps and these steel water bottles have been a great purchase. I'm also a strong advocate of the "going green" movement which I also can support with my purchase. Very well made and great image display. I like providing an quality, eco-friendly product. This is exactly what I was looking for. I used the customized water bottles to increase my exposure at all my trade-shows. I like the easy maintenance on these eco-friendly water bottles. We ordered 5,000 customized steel water bottles for all the marathons we are apart of. A great way to promoter ourselves and be eco-friendly too. These earth-friendly water bottles really have a sleek look about them. 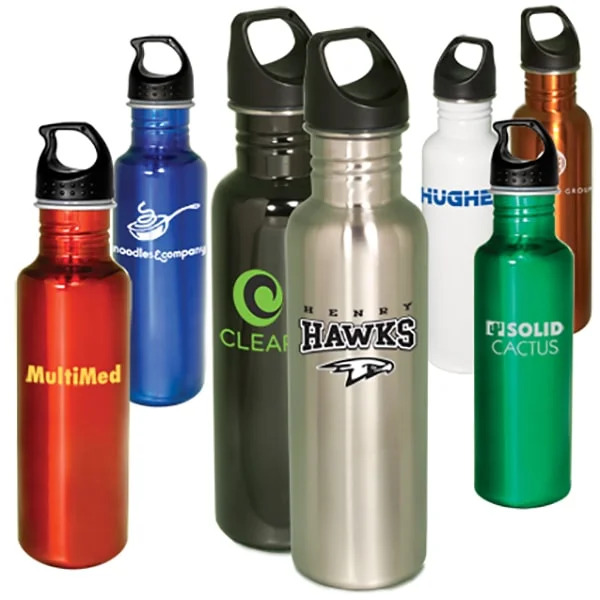 These eco-friendly water bottles have been a huge seller at our outdoor clothing company. We gain some exposure and know we have the environments best interest in mind. Working with Custom Earth Promos on my marketing campaign was pleasurable and very informative. These have been clutch at our bike shop. I can't keep them on the shelves. Just got my eco-friendly water bottles delivered. I wasn't expecting them until next week so it was a pleasant surprise. Wouldn't ever work with another company after my last order of 7k stainless steel water bottles. The boost in business I received after my last venue was amazing. I handed out some of these earth-friendly steel water bottles and clearly they helped my cause. I was having some issues with my design plan. I got Cory from Custom Earth Promos on the phone and he helped me considerably. Thanks for all the help.